David Germain of The Huffington Post calls Nicholas Sparks the "melodramatic machine." Machine's a good word, because it seems like he churns out dreck at an alarming rate. Worse, there's some kind of unspoken understanding that women like this crap. I'll admit I haven't seen all the Nicholas Sparks movies — just the awful, no good, terrible A Walk To Remember and the sorta-hot-when-old-people-weren't-on-the-screen one, The Notebook. But I don't even think I could see The Last Song, since the poster alone makes me want to barf. Which is not to say I don't like trash. I like trashy books and trashy movies. Just not this particular shmaltzy, vanilla trash. It seems like the blandness is part of the formula, though — readers and viewers know what they're getting into, and it's nothing too scary, too weird or too outside the box. 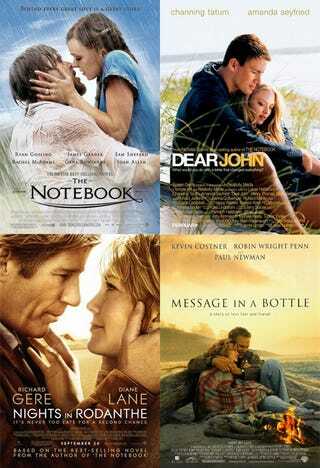 Nicholas Sparks' romance/tragedy stories are like Hallmark cards: Much of the emotion can be summed up in a simple picture and a few words. A couple hugging on a beach or kissing in the rain. Words like "last," "remember," "message." There's no mental challenge here; no cops or circus freaks or savvy New York women with shoe obsessions. Just normal, everyday white people with issues. To some it's boring; to others, that's the appeal. "You read me because you don't know what to expect. Is it going to be happy? Do they get together? Do they not? Does someone die? Does Richard Gere drive off a cliff in South America? You don't know, and so you read for a surprise. And to be honest, the more books you write, the harder it is to surprise people." Please, we all know that if Richard Gere is going to drive off a cliff, it will be straight into the arms of his one true love. Couples embracing on a beach. How surprising!